Don’t break out the knee pads and scrub brushes just yet. Whether your floor is laminate or tile, linoleum or cork, we’ve got the simplest and safest ways to keep them looking spotless and new. 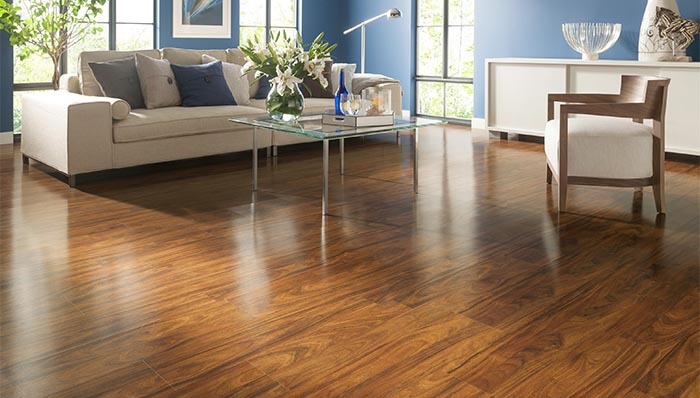 Your laminate may resemble hardwood planks or natural-stone tile, but you still need to care for it as a laminate. The good news: Very few things will harm a laminate floor, says Bill Dearing, president of the North American Laminate Flooring Association. After all, the planks are constructed in sun- and light-resistant layers to maintain a like-new appearance for years. That said, it’s important to keep water from getting underneath the planks. Dearing recommends dry mopping or vacuuming the floor, making sure the machine is on tile mode (as opposed to carpet) so the beater bar is raised. Spot-clean with a slightly damp mop (or a wet Swiffer, since they aren’t sopping wet) when necessary. Dearing’s last bit of advice: Never polish a laminate floor. If the finish of a plank looks damaged, it’s best to replace it. The same quality that makes this natural material so beautiful—its porosity—makes it very susceptible to water damage. Because it’s so absorbent, most cork flooring is sealed, but you still need to proceed with caution. “Vacuum often to prevent scratching, wipe up spills immediately, and wash cork floors once a week,” says Leslie Reichert, the Green Cleaning Coach. Reichert suggests skipping commercial cleaning products in favor of a vinegar-and-soapy-water solution: Place 1/4 cup vinegar in a spray bottle with 1 drop of dish soap and warm water. Naturally acidic vinegar works with the soap to break down dirt, cut through build-up and disinfect. Don’t shake the solution (that would create suds), just gently combine the ingredients in a spray bottle by rocking it back and forth. Spray the floor a section at a time and wipe with a damp microfiber mop as you go. Hardwood floors typically have one of two finishes: polyurethane or wax. Not sure what you’re standing on? Rub your finger across the surface, says Meg Roberts, president of Molly Maid. If a smudge appears, the floor is likely waxed. Sealed wood floors typically have a urethane, polyurethane, or polyacrylic coating. This protects them from stains and water damage, says Roberts. To clean, simply mix ¼ cup of mild or pH-neutral soap (try Seventh Generation All-Purpose Natural Cleaner Concentrate) with water in a bucket. (Steer clear of acidic vinegar solutions, which can dull wood floors over time.) Then damp-mop (be sure the mop is wrung out very well), using a dry microfiber cloth to wipe up any excess moisture. Clean high-traffic areas like the kitchen once a week; for less-trafficked areas, mop once a month. If you have waxed wood floors, you’re off the hook—sort of. Since this type of flooring can be damaged by even small amounts of water, keep damp mops away from this surface, and instead sweep, dust mop or vacuum regularly. Bamboo is sustainable, beautiful—and in some cases, softer and more prone to nicks and scratches than hardwood floors. Unless you have strand bamboo flooring—the hardest, most durable type available—be extra vigilant about regularly sweeping up dirt and debris. “Especially with the expense of bamboo, extra care should be used,” says Roberts, who uses a tennis ball to gently buff out marks. She uses the same cleaning solution on bamboo as on hardwood: mix ¼ cup of mild or pH-neutral soap in one bucket of water. Swipe across floor using a barely-damp mop, wiping up excess moisture with a dry microfiber cloth. We’re not talking nearly-indestructible vinyl flooring (see the next section for tips on cleaning that surface). True linoleum is made from linseed oil, resin, limestone, wood fiber and cork dust, and colored with mineral pigments. Treat this resilient, natural flooring as you would cork, advises Reichert: Mix up a spray bottle of just a few drops of dish soap and hot water, then spritz a section of the floor at a time and wipe with a damp microfiber mop. The floor should air-dry almost immediately, but if it feels slightly sticky to the touch just swipe it with another clean, damp microfiber mop or cloth. For weekly cleaning, use Reichert’s spritz-and-dry mop technique to keep tile floors looking fresh: Gently mix 1/4 cup vinegar in a 16-ounce spray bottle with 1 drop of dish soap and warm water. Spray the floor one section at a time and wipe with a damp microfiber mop as you go. For periodic deep cleans, she likes to use a steam cleaner to clean both tile and grout—the steam does the work of removing stains (and bacteria! ), so you don’t feel like you got an extra workout right there in your kitchen. Whatever you do, leave the vinegar in the pantry, warns Kris Koenig, CEO of eco-friendly cleaning company Natura Clean, in Middleton, Wiss. Even a small amount of the acidic liquid could damage stone floors, as could bleach and ammonia. Instead, mop sealed stone floors with a pH-neutral, non-chelating cleaner that won’t react adversely to the minerals in natural surfaces. Koenig’s favorite is Naturally It’s Clean Floors cleaner. If your stone tiles are unsealed, says Reichert, simply mop with a microfiber mop and hot water; chemicals would penetrate the stone. For stubborn dirt, use a steam cleaner. For weekly cleaning, use Reichert’s spritz-and-dry mop technique to keep tile floors looking fresh: Gently mix 1/4 cup vinegar in a 16-ounce spray bottle with 1 drop of dish soap and warm water. Spray the floor one section at a time and wipe with a damp microfiber mop as you go. For periodic deep cleans, she likes to use a steam cleaner to clean both tile and grout—the steam does the work of removing stains (and bacteria! ), so you don’t feel like you’re getting an extra workout right there in your kitchen.